*******************************************************************THIS IS A MUST SEE SHORT FILM EXPLAINING THE SACRED ALIGNMENT CREATING THE SACRED CROSS AND SIGNIFICANCE OF COMING TOGETHER AS WORLD SERVERS TO ASSIST IN BRINGING FORWARD THE DIVINE PLAN ON EARTH; The Work continues on into the New Year 2013, the Year of Transformation. MEDITATION CREATING THE SACRED CROSS USING THE 4 DIRECTIONS..
Dear friends, I am Jeshua. I represent the Christ energy, which is now born on Earth in and through you. I ask you to imagine my energy as a sun. Just think of the actual Sun, that radiant image of life and strength. You also can see the sun as a metaphor, as an image of yourself, of your own being and soul. Focus your consciousness for a few moments on the center of the Sun, and enter into it with your imagination - do it very calmly and quietly. 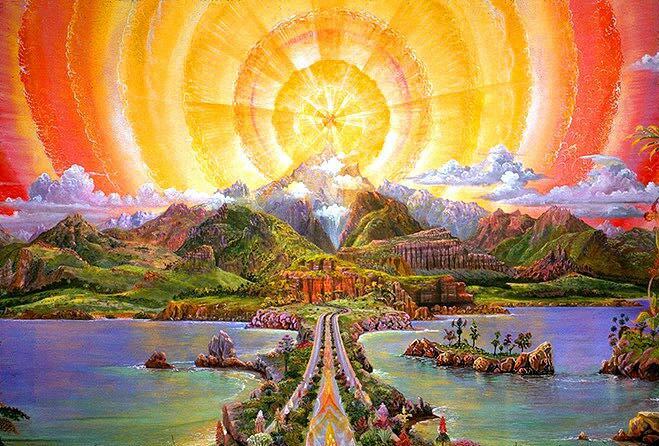 Feel the immeasurable power of the energy field that is the Sun and feel yourself in the center of that huge volcano of energy. Feel the silence and tranquillity there, and the spontaneous nature of this radiance that happens by itself: the Sun radiates its light outward effortlessly. Rest, surrounded by light, in the center of the Sun and feel how right and natural it is that you are carried by this source of power. This light is there for you, because you are, in your essence, yourself a sun. Allow yourself to relax and sink into this light. Let this light envelop you in a gentle and loving way: very flowing, warming, but never burning. Allow this light to flow through you completely and to remind you of who you are: a soul, a sun, a star in all the cells of your body. Allow every cell in your body to be imbued with this healing light of your soul-sun. You can find the center of this sun, your central core, whenever in your daily life you return to the Now by bringing your attention completely into the present. If you are busy with the past or the future, you go out of your center and you lose connection with your light source - that which carries you. But what is the Now really? You are asked to be in the Now, in the moment, in the present, but what is that Now in reality? Once you talk about it, it is already over. The Now is not a minute, not a second; it cannot be actually named as a unit of time. The Now evades you when you want to determine what it is. There are no limiting boundaries to the time that is the Now. The Now defies ordinary ways of thinking. In the earthly sense, you can calculate time and count it - there are 24 hours in a day, 60 minutes in an hour, 7 days in a week, etc. That way of viewing time is not natural to the human spirit. The Now is free from time - what unit of time can describe it? The human mind cannot contain or understand the Now, because it is not subject to the logic of thought, although it is quite understandable to your feelings. You know what it is like to completely lose yourself in the moment; for example, in an instant of enjoyment. There may have been times when you experienced something beautiful and at the same time you realized how special that moment was. You were aware and completely open to the experience that resonated and flowed through your body, soul, and feelings. When that happens, you are one with the experience and one with the Now - you are the Now! When you are in the Now, you are also then in the center of your sun, your soul, and all change takes place from that central core within you. We talked today about fear and how you feel anxious when you are outside your core and away from your center. Fear is also linked to thinking in calculable time, the past and the future: “What will happen? What will go wrong?” Anticipating the future from fear is very human, but it can happen only if you have moved from your center, moved from the Now. Being in the Now means that all your inner strengths come together and become integrated, and you do this by being completely present in your body, soul, and feelings. I want to say a little more about the concept of time, and how it can intimidate and frighten you. During the last few decades, there have been many predictions about certain dates that lie in the future. Time is seen then as a sort of line that runs from the present toward the future and on that basis certain events become fixed. By accepting that vision of time, you could then be able to prepare for the coming events, and you can do that from either fear or trust. But is this a true image? Is the future really a straight line on which things are fixed in place? Is the future the sum total of all those hours, days, and months that lie ahead of you? Or is this a wholly restrictive way of looking at time and the future? You who are here and who hear this, know that there is more to life than what is just visible in the world. You see the form of things - someone's body, the trees or animals, or even the plants and stones - but you intuit that there is something within all those things that is not visible to the eyes and to the physical senses. You feel something mysterious is there, an inner life, which creates a unique individual or thing. You know you need to look more deeply than just at the surface of things, and you know also what it is to experience joy when you penetrate into their inner world, which is also within you. That is real life; that is the reality of all things. The exterior is only a manifestation of that inner world. What about time then? If you look at time as a line of quantifiable units or spaces - days, weeks, months, years - than you look at time from only the outside; from the perspective of that which you can measure with a clock or a ruler. But time as seen from the inside, as an experience, is something quite different. That inner perspective becomes evident when you consider the concept of the Now. The concept of the Now can not be based on the clock or on the calendar; it is based on your conscious presence, on your awareness. According to your inner sense of time, time can go very fast or very slow, independently of how the clock ticks. “Inner time” can stand still when you experience bliss and stretch out endlessly when you are bored; inner time flows according to the way you experience things What about the future and the past? What is their reality when seen from the inside and not from the outside? Imagine again, for a moment, that you are in the core of the sun of your soul, where in its motionless center there is no time - there is only eternity. Although there is movement in the form of rays radiating out, there is a primordial essence that is always just there. You can call it God consciousness, if you wish, but it is Eternal Life, and it is there inside you, too, deep in your center. A sun emits rays, and imagine that you are present in those rays that effortlessly radiate from your sun. By way of those rays, you can manifest yourself in many lives and be anywhere in the universe. Every ray is a life in time and space, you might say, in which you have taken on a specific form: a body. You have experiences in that body; it has a beginning and an end; it is born and it dies; it is mortal. To live in such a body, focused in time, you become biologically aware and under the influence of the concept of time. You begin to see things in terms of the finite, but your true center is in the center of your sun and you, as this sun, emit countless rays that are possible manifestations of you in the future - potential lives and expressions of yourself. The future is not fixed; although every timeline is a very real possibility in the Now, you choose to activate one and make it real in your world. See the past also in this way for a moment. You think there is only one timeline that runs from the past to the Now, but seen from the center point of your sun, that is not so. Behind you lies a whole range of timelines, some of which have become activated by you and your choices, and many others which lie dormant, so to speak, but which might still be activated at some time in your future. The past is not fixed and “over”: you can recreate the past by reinterpreting the experiences you had, by interacting with them from the present. This is possible because the past is not something outside of you, it is not a dot on a line. I will give an example to clarify this matter. Let us assume you felt afflicted by your past relationship with your mother or your father; that you felt you were not recognized for who you were and experienced fear and a lack of security in that relationship. You believe your life has been determined by that past and you feel a sense of victimhood because of it. You feel you were made into who you are now due partly to your parents, as a product of your upbringing. But suppose that you, in the course of your life, are going to delve into your consciousness through the process of inner growth. You make the connection with your soul and you go into who you are at your core, the sun within you. Through this process you now form a much broader perspective of your life. You now see your parents in the context of their past, for example, and you now see their powerlessness and their images of fear and negative convictions. You have forgiveness in your heart. This broader perspective helps you to gradually feel less the victim of your parents. Moreover, you start to see that there is a part of you that has never been really touched by what happened to you, a part that has remained whole and unscathed. You increasingly feel your own autonomy and independence. And the more you connect during your life with the center point of the sun within you, the easier will it be for you to let go of the past, such as your relationship with your parents. The way you experienced that relationship was only one ray, one possible timeline, and by changing your awareness of who you really are, you can shift to another experience of the past, and to another timeline. You are now able to look at the relationship with your mother and father from the perspective of the soul, of which as a child you were not aware. Since you are now more in your center core, you are able to perceive your parents in a different light, in a more gentle, forgiving way. You can explain to the child within you how certain painful experiences helped you grow and how your parents were unaware of the pain they inflicted. Your present consciousness recreates the past by liberating the energy within you that got imprisoned by it. You are literally creating a new timeline in the past, which will affect your current relationship with your parents. They will sense a difference in you and if they are open to it, your relationship will change for the better. You have opened up the past through your new perception, and thus created a new timeline in which more understanding and love exists. This is a real possibility. With your consciousness you can break open time. Time is not fixed and closed behind you; the past is not really over. Whatever you have experienced, even when there were traumatizing events in your past which profoundly influenced you, there are openings available from the present to bring comfort, love, and encouragement to yourself in that past. The past is like so many solar rays that come from your core, to which you can still make a connection if you go to the center of the Sun. You can recreate your own past - enlighten and lighten it - by looking with more understanding at who you were and at the people who were around you. If you do this, you simultaneously recreate the past as well as create a new future, because shedding light on the past and altering the energy you carry from the past will activate a new and brighter future for you. Neither past nor future are fixed; you can influence both of them from the Now moment and you can do so most powerfully when you are in your center, which means you are connected to your soul. Where you stand in the Now is an experience - a living, creative moment - and not a dash on a ruler, nor a dash on a timeline. From the well of the Now, all timelines spring. The Now is where you are in the present moment - where you are with your full attention is the Now. As soon as you are attentive to this most enlightened and present part of you - your core, your soul, your consciousness - then you radiate from this sun-center toward both your past and your future, and it all comes together. Time is not a straight line; you can imagine it better as an intricate 3D spider web, fanning out in all directions both past and future. And what can you do with this knowledge in the present, in your everyday life? You can become aware of your own strength and potential. Everything is within the range of your power, both past and future. There is no power outside you; no power that determines your future or says what your past must be - nothing is determined. You are the creator, always, and in every moment. In that sense, you are master over your own past and your own future. If you remain in your core, you can hold on to this consciousness, this source of light. In the continual realization of this source lies your confidence, safety, and surrender. If you are in the center of this sun, you know you can surrender to it - it is apparent and natural for you to do so. However, once you leave the center and start thinking: "How do I escape my terrible past? How do I create a future in this world that is so full of fear and threat? ", you are already out of your core. The art of this transformative process is to go back into your core, your center, and to not want to solve problems through thinking, but to seek solutions from within the core, the center of your sun, the Now - where there is no time! This is the Home where you are who you are, and where there is nothing outside you that can determine or keep you from your destiny. I ask you to imagine again that you are in the center of this radiant sun that you are. You feel one with the light and strength that is there, and it is effortless for you to do so, because this sun exists within you already. And now imagine that somewhere in that web of rays emitting from your inner sun is a timeline from the past that needs to come more into the light. You do not have to feel or see something concrete, simply imagine that the light from your sun easily fills that dark alleyway from the past. It may be that you do not quite manage to fully rekindle the light there, but the light has made an initial connection with that timeline from the past, so you can come to it again whenever you want to do so. Say to these past events now surrounded by your sun-light: “Everything that needs to receive Light, receives that Light from me. Old pain and trauma that want to be resolved and released can now come forth into my Light.” Let go of all clinging to these past occurrences, they do not define who you are; you are not the darkness you perceive there - you are the Light! You - operating from the center of your Sun - are the liberator and healer of the past and thereby the creator of the future. Now go to the future. The future lies around you as a huge 3D spider web with many threads, and you are at its center. The future is not something that comes to you from the outside. The threads of the web spring from your heart; they are spun effortlessly by the continual thoughts and feelings you have. The inner states you fluctuate between create countless possible timelines. You do not have to do anything special to make that happen - it simply happens because you are a sun who cannot help but radiate outwardly. It is in your nature to be a Creator. Now, ask the future, ask that web of timelines to show you what is the brightest thread for you at the moment. Ask: "What do I need to focus on now? What direction should I follow now so that I can walk into a beautiful and radiant future? What do I need to be aware of now, in this moment?" There will come an urging from the center of this sun that you are, so just be open to it. Your soul wants to reassure you and to encourage you to connect with a powerful, beautiful future that is already lying dormant within your being. Be aware of how effortlessly that future will come to you; you do not have to strive or work for it. Stay in the Now. Feel in your heart how the energy of this beautiful, bright future is already a part of you. In this way, you will draw it to yourself with more ease. Feel that beautiful future in your heart and awaken it by simply rejoicing in it. Be open to its lovely vibration. Invite it into your heart and into your hands, and through your open hands, let it flow out into the Earth. Let it happen - it will take root naturally. Have confidence in your future and feel your sun power deeply within. Feel it in your heart, feel it in your belly, feel it in your legs. MAY PEACE, UNITY, HARMONY, JOY AND COMPASSION PREVAIL ON EARTH.